While shorthanded, Brandon Tanev chased down a puck in the Penguins zone, chipped it behind the net before moving out to the slot and sliding a shot between the legs of Casey DeSmith and in. Dominik Simon took a pass from Jake Guentzel inside the Jets zone and from the left circle fed a pass across to a streaking Sidney Crosby, who beat Connor Hellebuyck blocker side with a backhand. Nikolaj Ehlers carried the puck over the Penguins blueline before dropping a pass to Blake Wheeler, who slid a pass across to Mark Scheifele in the left circle where Scheifele one-timed a shot past Casey DeSmith. Derek Grant gathered the puck behind the Jets net and sent a pass to Riley Sheahan in the slot. Sheahan fired a shot that was stopped by Connor Hellebuyck, but the rebound bounced just above the goal line in the crease before it was tapped in by Sheahan. 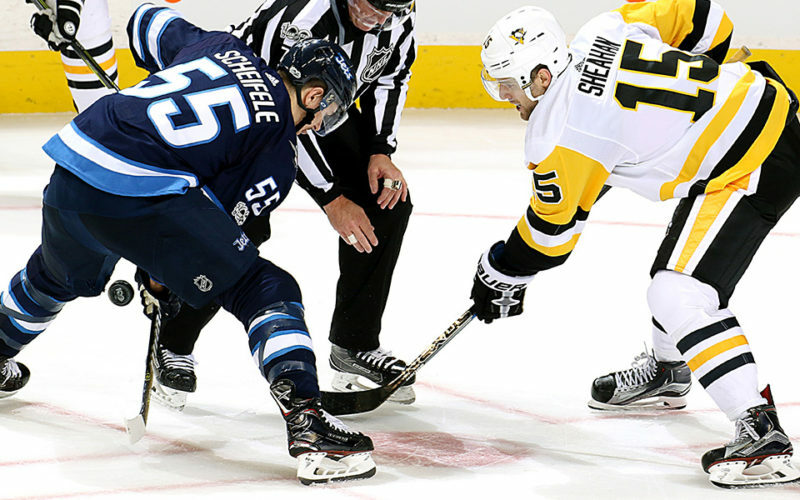 From the Jets blueline, Blake Wheeler bounced a pass off the boards to Mark Scheifele, who moved into the right circle and let a wrist shot go that beat Casey DeSmith on the blocker side. Derek Grant took a pass from Garrett Wilson at the Jets blueline and moved into the right circle before snapping a shot that snuck under the arm of Connor Hellebuyck and in. Phil Kessel sent the puck from the right corner to the front of the net where it bounced off Blake Wheeler right to the stick of Zach Aston-Reese, who one-timed a shot over the glove of Connor Hellebuyck and in. Fall to 13-8-2 on the season and 8-3-2 at Bell MTS Place. Drop to 7-3-2 when leading after the second period this season. Fall to 5-4-1 against Eastern Conference opponents this season. Scored twice in the second period. It’s the sixth time in his career he’s scored two goals in a period – four times in second periods and twice in third periods. It’s the third time this season Scheifele has had a two-goal game. Was the Jets top face-off man, going 9-for-14 (64%) at the dot. Scored the first goal of the game shorthanded. It’s his second goal in as many games and third goal in his last four games. It’s the first time in his career he’s scored in back-to-back games. It’s also his fourth shorthanded goal in the last two seasons. Had two assists in the second period. It’s his first multi-point game since having a streak of four multi-point games from Nov. 1-11. Led the Jets with 23:11 TOI. Had his five-game point streak (11G, 1A) and four-game goal streak (11G) come to an end tonight. Led the Jets with four shots and now has a team-high 94 shots on the season. Tied Brandon Tanev for the team high with three hits. Lowry leads the Jets with 64 hits this season. Had two assists tonight to give him seven on the season.